It doesn’t take much effort to turn an ordinary side dish into an extraordinary side dish. A few additions can result in not only a more lively meal, but also a more wholesome one. 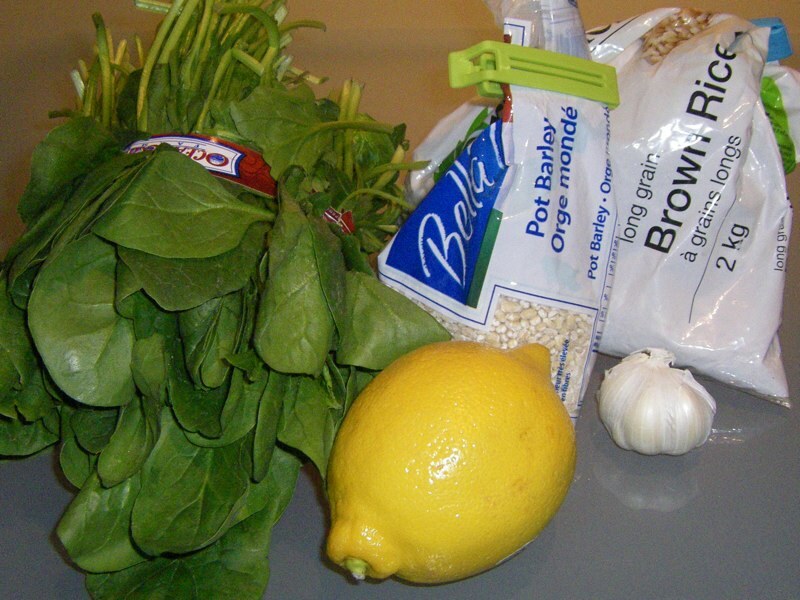 Lemon, garlic and spinach certainly punch up common rice in this recipe, both in flavour and nutrition. Hopefully you take away more than this recipe from this posting. Experiment with whatever you have on hand when you make the usual suspects with your next meal. Add a bit of orange juice and almonds to rice or a few peas and curry. Fry some onions to top your potatoes. I love just pepper and butter on my noodles. You never know what combination may thrill you! Try anything and everything! If you are less experimental, you can’t really go wrong with lemon and garlic as a starting point with any starch (rice, noodle, potato) or vegetable. Rice: I use a combination of 3/4 cup brown rice to 1/4 cup barley when I make rice because it sounds better for you, but you can use whatever rice you have! 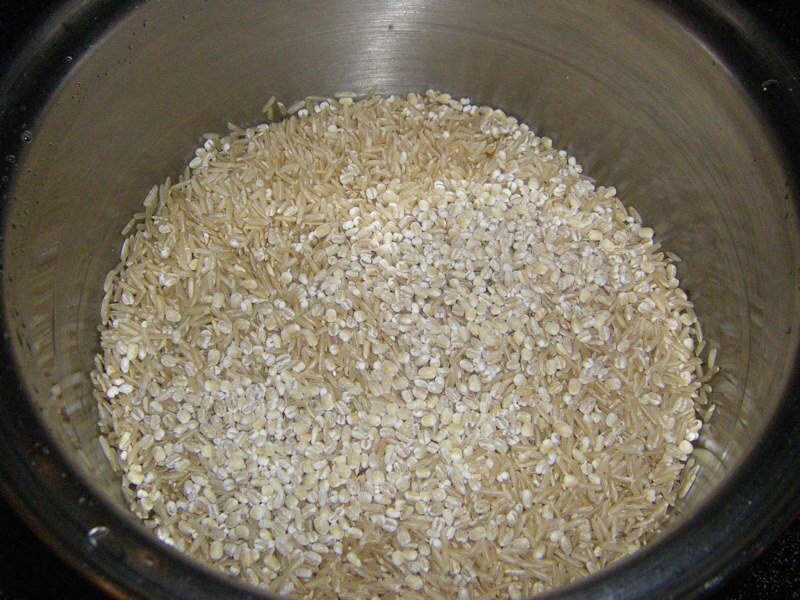 Put any quantity of dry rice in a pot and then add twice as much water. I use half a cup of dry rice with barley per person or serving. 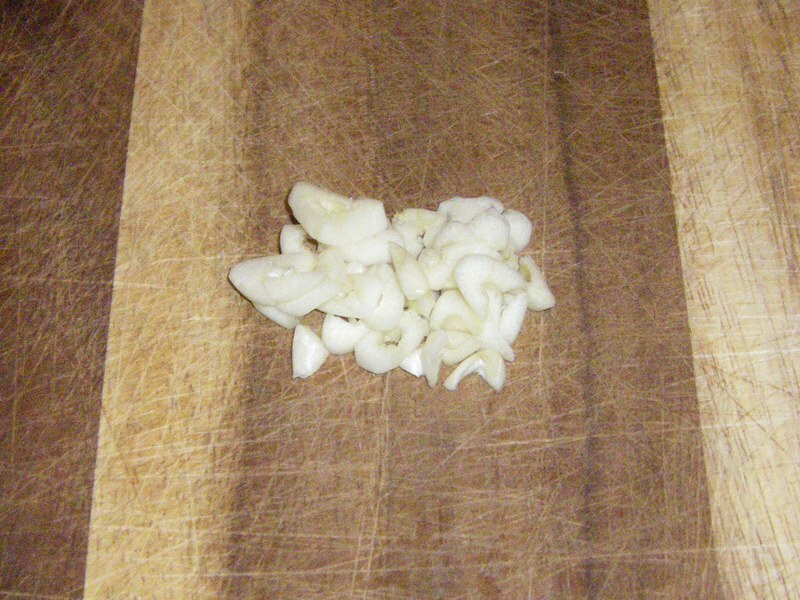 Slice a few cloves of garlic. Add to rice pot. Cover and cook on medium high until boiling, then turn down to a simmer until most of water is absorbed (the usual way to cook rice). Rinse off a bunch of spinach. You can use a lot more than you think as it cooks down dramatically. 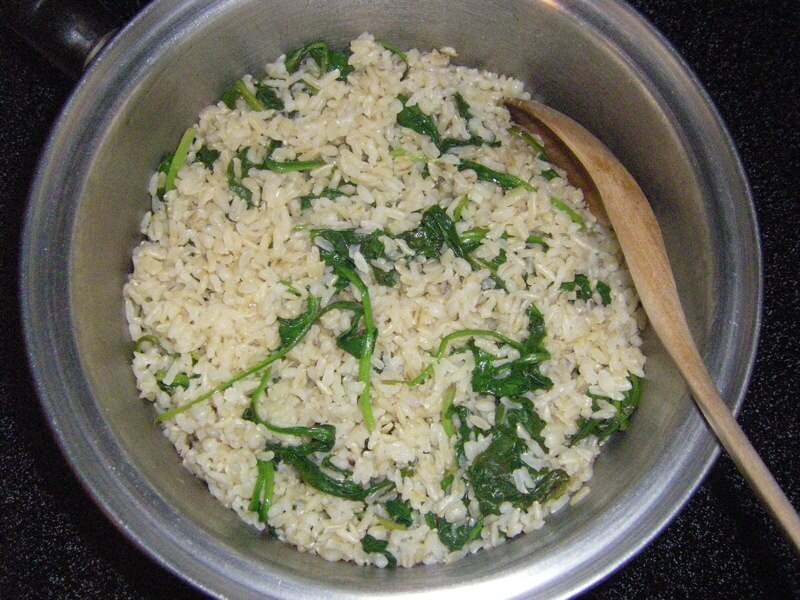 I used at least three times as much spinach as cooked rice and basically filled the rest of my pot with spinach. 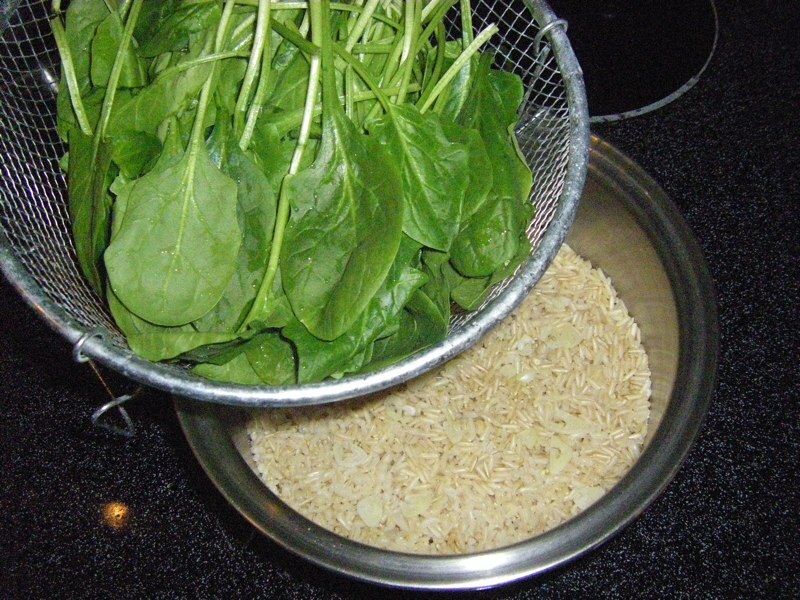 Add the spinach to the rice pot once the rice is almost done cooking. 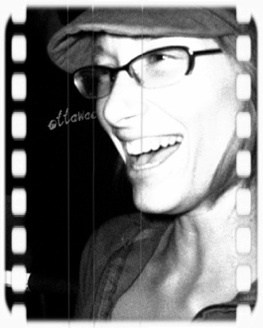 If you wait a little too long and the rice is entirely done cooking and starting to stick to the bottom of the pot accidentally (no… I don’t speak from experience, smile! ), just add a bit of water to the pot at the same time and continue, no worries! 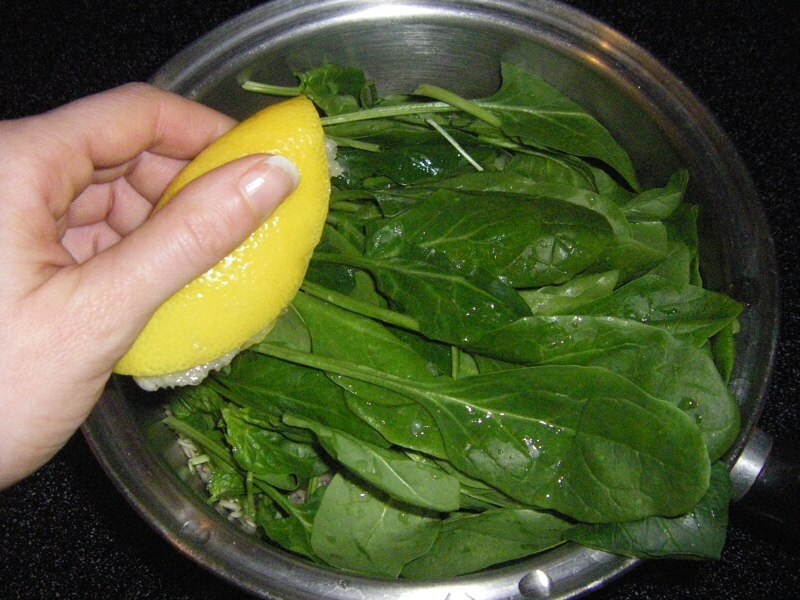 Squeeze the juice of half a lemon (for starting with about 1 cup of dry rice at the beginning) over the spinach in the rice pot. Cover and cook on medium low for less than five minutes until the spinach is wilted. Stir and serve! I squeezed the other half of lemon over a plain piece of chicken I cooked at the same time and served my special rice dish along side. What other tried and true side dish combinations do you serve? Jump up. Sounds great! What an quick fix to turn simple rice into a delicious side!